The Philadelphia Obituary Project Chronicles Lives Lost To Violence A new project is attempting to write an obituary of every homicide victim in Philadelphia, just as the city grapples with a spike in murders. The aim is to put human faces to the grim statistic. On Dec. 21, 2017, Trina Singleton holds a photo of her eldest son Darryl who was murdered in 2016. The Philadelphia Obituary Project, a new website, is working to show that homicide victims in Philadelphia are more than statistics. 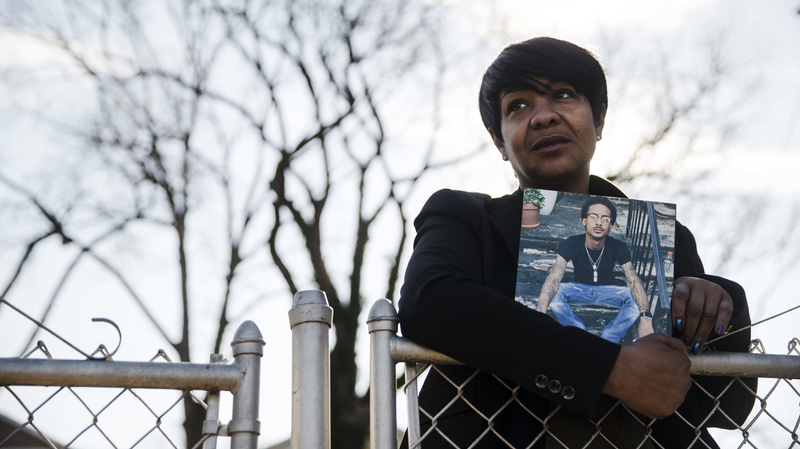 Trina Singleton picked up the newspaper the day after her son was murdered in Southwest Philadelphia. "Violent day in Philly: 10 people shot, three of them fatally," read the headline. Based on initial information from police, the article never revealed the fact that one of those three was Singleton's 24-year-old son, Darryl. He was skinny and had a trim goatee. He wore Malcolm X-style glasses. At the time of his death, he was in school studying to be an EMT. "Darryl was very friendly," the 46-year-old Singleton says. "He had a lot of personality. He liked helping people." "He didn't have a criminal background," continues Singleton, a real estate agent, who now lives in Philadelphia's suburbs. "He wasn't a troublemaker." But the life of Darryl, the eldest of her three children, was summarized in just one paragraph on Sept. 14, 2016, the day after he was shot to death. The article described the Tuesday he died as "a day of mayhem." Police aren't sure what provoked Darryl Singleton's shooting death, but he was found in the alleyway behind his childhood home after he was hanging out with friends there. Philadelphia lawyer Cletus Lyman says these kind of stories should not fade off into obscurity. He wants the murder statistics that contribute to street mayhem transformed into real stories. He has launched a new nonprofit website called Philadelphia Obituary Project. "I remember having discussions occasionally when I'd meet journalists. I'd complain about this problem. 'Why didn't you follow up on this?' And I guess it's a problem of space," says Lyman, a 72-year-old civil lawyer. "And they'd say, 'Yes, we just don't have time to do this.'" Families in Philadelphia can pay to have a lost loved one's obituary appear in a local newspaper. And if someone notable dies, many news outlets will write their own obituary. But Lyman wants every murder victim, regardless of status, to be properly memorialized. Similar efforts to chronicle the lives of those lost to violence are underway in Washington, D.C., Chicago and Trenton, N.J. Lyman says the hundreds murdered every year in Philadelphia deserve to be more than a data point. "They might give you a map with little dots on it, and that's all that these people were as far as information you could get publicly," Lyman says. "They were dots on a map." Turning a single dot into a story was therapeutic for Trina Singleton. "It does help the family with the healing and grieving process," she says. "We are able to reflect on the good parts of that person. And not just what happened to them." In the months since her son died, Singleton's family is still grasping for answers about her son's violent end. "When we cleaned his room out, we looked all over the place, because I'm saying, 'Was he into something that we didn't know about?' And there was nothing," she says. "There was nothing different than what a normal kid would have there." So far, the project has completed dozens of profiles by freelance reporters. Albert Stumm oversees the Obituary Project stories. He's a former Philadelphia Daily News editor. "Every single victim is a person, and every single person had hopes and dreams. They had people who loved them," Stumm says. "They had something in their lives that made them special, and those are the things that we're trying to focus on." The project's stories are different than a traditional newspaper obituary, which may highlight both the positive and the unfavorable details in a person's background. Instead, the Obituary Project allows the surviving family to decide what part of a victim's past is included, Stumm said. "What we're doing," he said, "is an addendum to the news cycle." Stumm said many families feel like their loved one is being blamed for being killed when articles emphasize the circumstances that led to the death. The project, Stumm said, has a different aim. "Not to be saying, 'Hey, well, sounds like a nice guy, but what did he do to get himself in that position?' "
Trina Singleton was devastated when her 24-year-old son, Darryl, was shot to death. 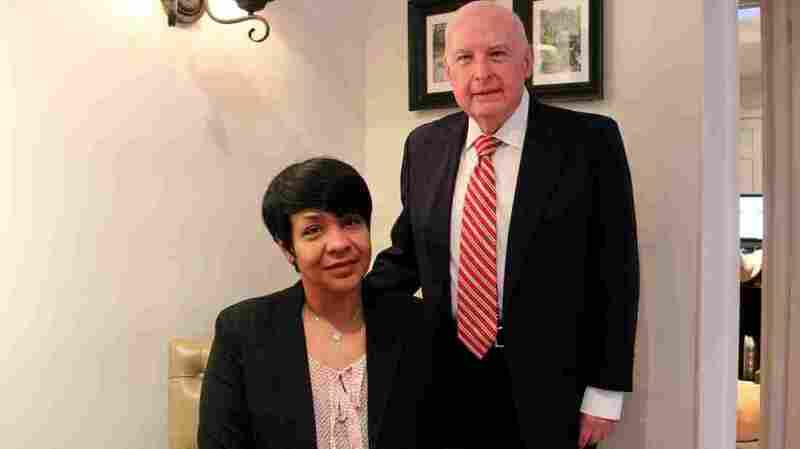 The Philadelphia Obituary Project, founded by attorney Cletus Lyman, gave her a way to celebrate her son's life and manage her grief. Right now, Lyman, the lawyer, is personally financing the project, but he said the group will soon launch a fundraising campaign. If they want to chronicle every murder victim in the city, which sometimes means several people in one day, it will take resources beyond just a few part-time journalists. At the Philadelphia Police Department headquarters, Commissioner Richard Ross says he hopes the Obituary Project wakes people up to the human toll of the city's high homicide rate. Last year, 317 people were murdered in Philadelphia, the highest rate in five years. "We all have got a role to play in stemming the tide of this violence," Ross says. Convincing witnesses to cooperate with authorities is one of the biggest obstacles in making arrests in murder cases. Maybe, Ross says, humanizing the grim numbers will encourage more witnesses to step forward to help solve open homicide cases. "These people shouldn't be relegated to a stat or a statistic," Ross says. "At the end of the day, you're talking about people regardless of what may have happened that caused their demise, and it's all unfortunate." Sixteen months after Darryl Singleton's death, police have still not made any arrests in connection with the case. Police are offering $20,000 for information leading to an arrest and conviction. Though participating in the Obituary Project was part of Singleton's healing process, details of the day of her son's death will never leave her. She says he had come to her suburban home to do laundry and finished some homework. He mentioned that he would not be going to his EMT class that night, since he says the instructor had canceled. So he went back to his place in Southwest Philadelphia instead. An hour and a half later, her other son called her husband with the awful news. When the call came in, her husband was out shopping for a gift for Darryl. The two shared a birthday. "It's really sad," Singleton says. "We had plans for the next day. It was hard. It was hard the way we found out." Singleton says when her son was growing up, she would keep a close eye on his circle of friends. She had him live with his grandparents out of state to get him out of the neighborhood during summers to "avoid mischief," she says. And she supported his dream of becoming an emergency responder before he died. "We didn't want our children to turn out like some others that we had seen," Singleton says, while sobbing. "So we tried hard, and for it to happen any way is kind of like, well, you try to do the right thing, and then it happens anyway."